1) Arsenal were founded in 1886 as Dial Square, changing name to Royal Arsenal within a month, before changing name to Woolwich Arsenal in 1893, then to The Arsenal in 1914 before finally settling for the current name in 1920. 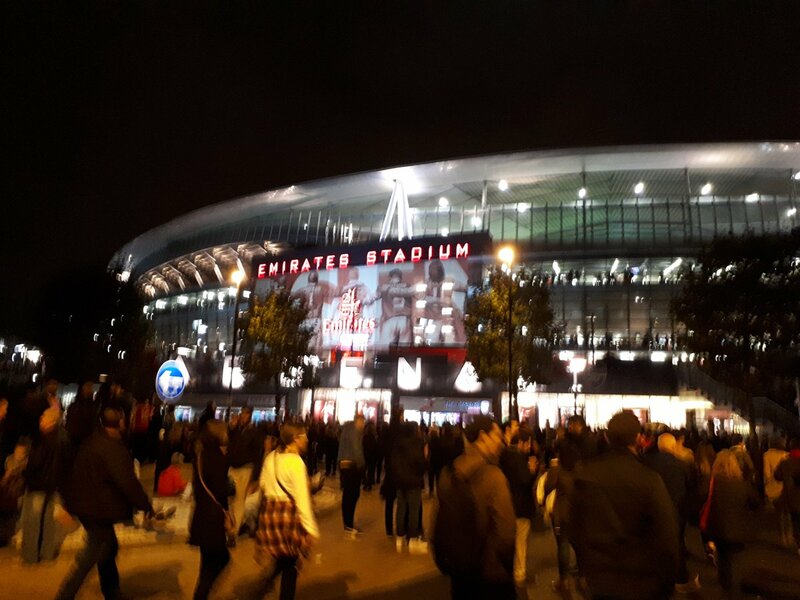 2) Arsenal have only ever been relegated once, back in 1913, and have been in the top-flight of English football since 1919 (though there was some controversy about how they got there, as pre-war records showed then only finishing 6th in the Second Division in the last season before World War 1). 3) Arsenal first won the top-flight title in 1931, and have since gone on to win it twelve times: in 1933, 1934, 1935, 1938, 1948, 1953, 1971, 1989, 1991, 1998, 2002 and 2004. Notably, their last title win saw them go the entire league campaign unbeaten, a feat only accomplished once before back in the early years of the Football League. 4) Arsenal have won the FA Cup more times than any other club, winning the trophy thirteen times: in 1930, 1936, 1950, 1971, 1979, 1993, 1998, 2002, 2005, 2014, 2015 and 2017. 5) Other domestic honours the club have won include two League Cups, won in 1987 and 1993, and fifteen Community Shields, won in 1930, 1931, 1933, 1934, 1938, 1948, 1953, 1991, 1998, 1999, 2002, 2004, 2014, 2015 and 2017. 6) Arsenal reached the final of the UEFA Champions League at the end of the 2005/06 season, losing 2-1 in the final after goalkeeper Jens Lehmann was sent off in the 18th minute for a foul on Samuel Eto'o. 7) Arsenal had competed in the Champions League for seventeen consecutive seasons, from the 2000/01 season to the 2016/17 season, but a finish outside the top 4 at the end of last season saw the club drop into the Europa League for this season. 8) Arsene Wenger is currently the longest-serving manager in the Football League, having been manager of Arsenal since the 1st of October, 1996; he's been manager of Arsenal for longer than I have been alive, in fact. 9) The player to have made the most appearances for Arsenal is David O'Leary, who made 772 matches for the club from 1975-1993. Thierry Henry is the club's all-time highest goalscorer, having scored 228 goals in all competitions between 1999 and 2012. 10) The record attendance at The Emirates Stadium is 60,161 for a 2-2 draw against Manchester United in November 2007. 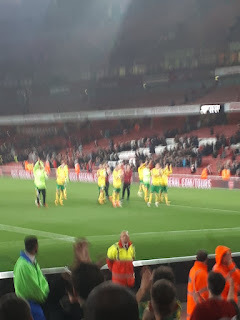 After Norwich had beaten Brentford to make it through to the 4th Round of the League Cup, I had jokingly made a comment to the effect of hoping Norwich would, against all odds, be drawn away against Arsenal, as I would definitely be able to go if that were to happen. Surprisingly, the draw actually pulled out that very game I was hoping for, so it was then just a matter of waiting for the tickets to go on sale and getting one (or two, as I was trying to get one for Matt as well). When the tickets did go on sale, I was able to, with extreme difficulty, get one, but by the time I got onto the tickets website again to buy a second, they had sold out. 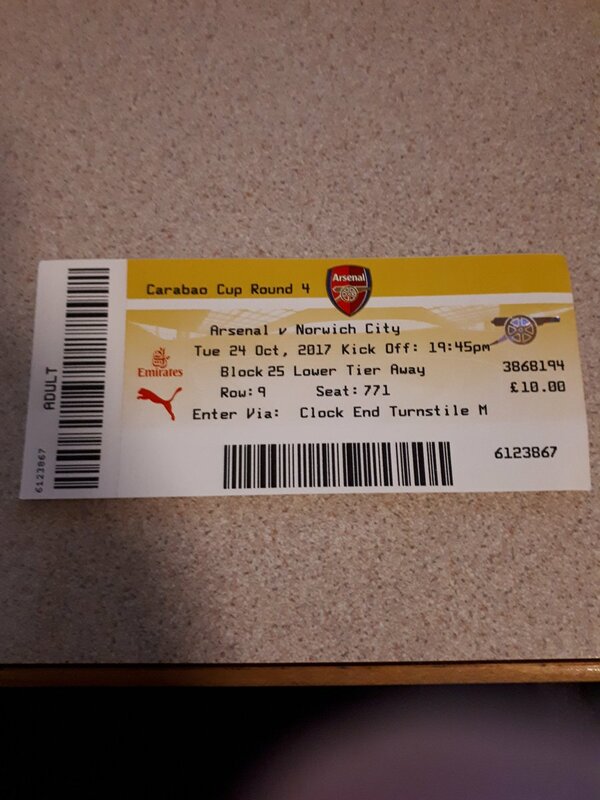 As such, I had to wait and see if we would be given more tickets, given that we had sold out our initial allocation of 5,000 tickets within just two and a half hours. To my relief, the club announced a week and a half or so later that this would be the case, with the only caveat being that the new tickets were more expensive and in the upper tier. As such, I was able to get one for Matt - which he duly paid me back for - but, unless we could sort out some swaps with my uncle or my dad and his wife, we would not be able to sit together. This then became inevitable when my dad text me to tell that he had injured his leg on his honeymoon in the Lake District, and couldn't go to the game as a result. 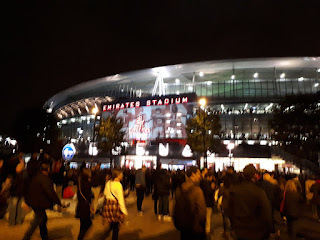 In any event, I met Matt in London at Euston Underground station (that's the one nearest to his University, the University College London) and from there we headed to Highbury & Islington station, walking from there to the ground. We stayed outside the ground for a while, having some food and drink before joining the queues into the ground at around 7:15pm. We got into the concourse eventually after about 15 minutes queuing, but it was then a matter of finding where we had to go to get to our seats; thankfully some helpful staff were at hand to deal with that. It was at this point that I bumped into my uncle, who I had seen queuing outside, and we briefly talked before going into our separate areas of the ground. 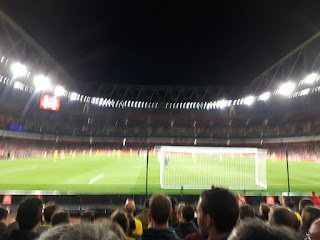 Ultimately, I got to my seat a couple of minutes before kick-off (long queues into the toilets) and quickly joined in the singing and chanting of the 8,800 Norwich fans (our largest away following this millennium, excluding the two play-off final appearances). 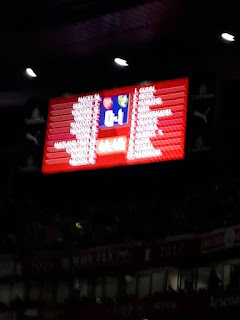 Most of this game went as I expected, with Arsenal having most of the ball and trying to break us down, while we were on occasion able to break forward to have a chance of our own. This is how the first half went, and it was on one of these breaks that we took the lead, a James Maddison pass setting Josh Murphy through on goal to dink the ball over the keeper to make it 1-0 to us. 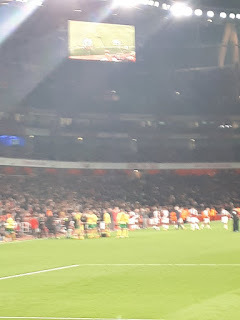 Arsenal pressed for an equaliser for the rest of the first half - and also much of the second - while we had a few chances of our own, but ultimately it was Arsenal who equalised with a few minutes of the second half to go, Eddie Nketiah coming on as a substitute and instantly scoring from the corner. The game stayed 1-1 until full-time, so we went to extra time. 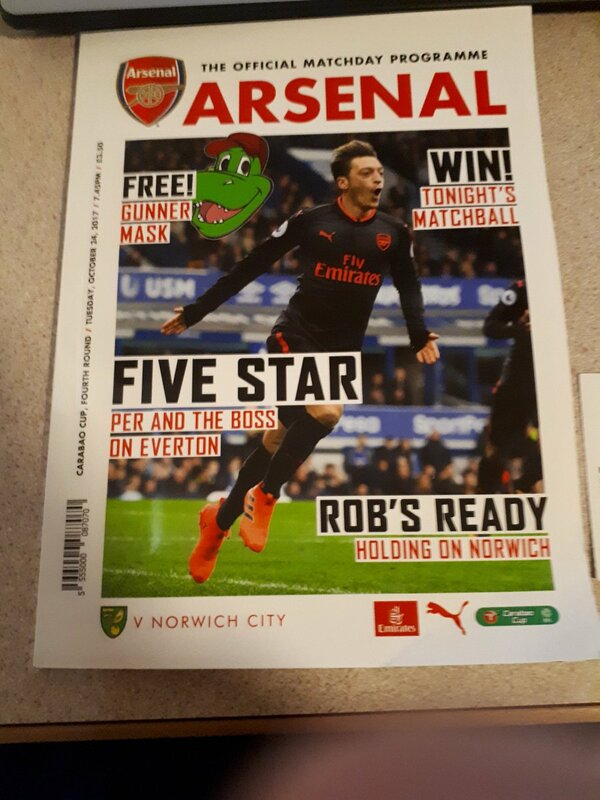 At this point, with most of the Norwich players having been involved in Sunday's East Anglian derby (this applied to 13 of the 15 players who played for us in the game), we were starting to look tired, whereas Arsenal - with the luxury of being able to field virtually an entirely new team - did not look anywhere near as fatigued. As such, it was perhaps unsurprising when they took the lead, Eddie Nketiah once again getting his head on the ball from a corner to score. However, despite this setback we did not give up, and even though we were tired we pushed to try and find an equaliser, and ultimately should have had one from the penalty spot after James Husband was brought down in the box. However, the referee decided that this wasn't a penalty despite it being as stonewall as they come; I can guarantee that he would have given Arsenal the penalty at the other end in the same situation. By the same notion, there were some questions about whether the referee was right to award Arsenal the corner that their second goal came from, with it looking like the ball went out for a throw-in instead. 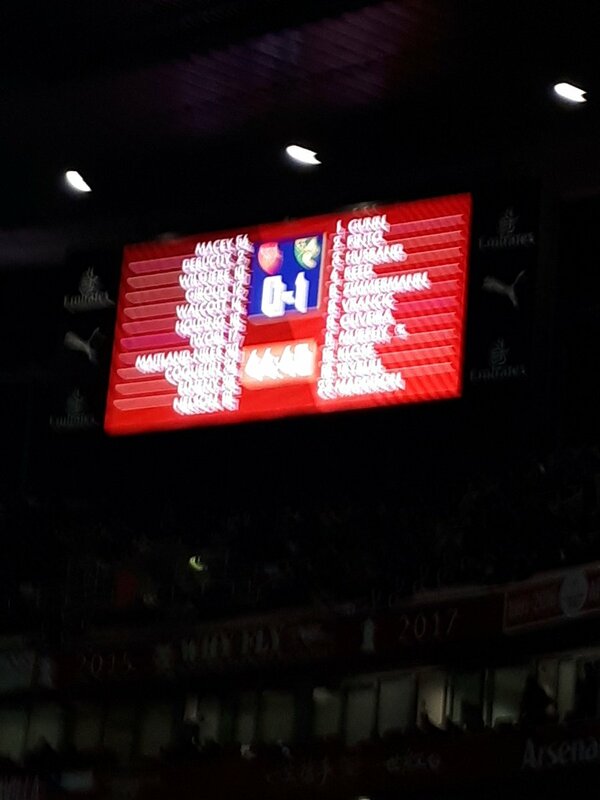 Furthermore, Arsenal should have been down to 10 men in the first half, Elneny bringing down Oliveira as the last man when the latter was through on goal. However, as always happens, the referee didn't have the guts to give the right decisions, instead choosing to cheat and favour the home team (the fact that this always happens with the biggest teams in the Premier League is just one part of why I am so disillusioned with that level of football, and why I am turning towards non-league more and more). 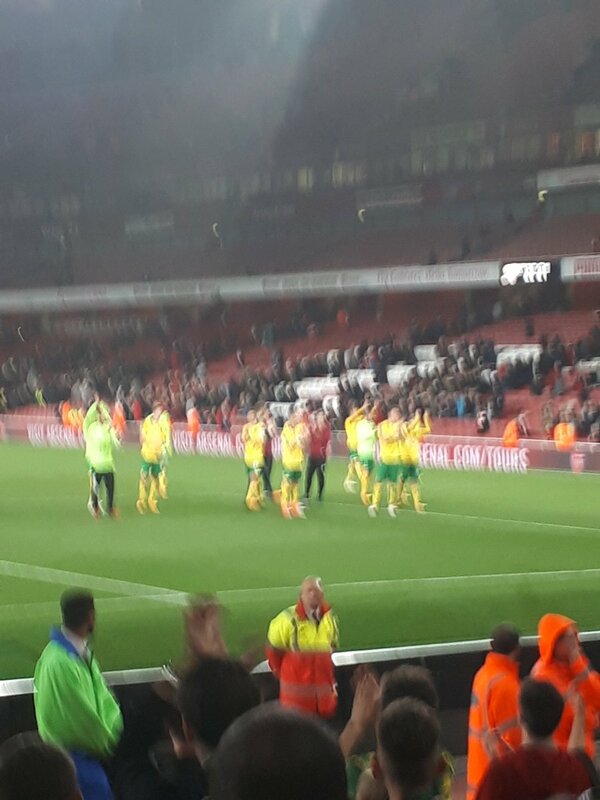 After the game, I stayed in the ground for around 5-10 minutes to applaud the Norwich players for their valiant efforts, eventually finding Matt outside the ground. However, it was a bit of a mess from there, as it took ages to get into Highbury & Islington Underground station and back onto the tube, and because of this I didn't get to London Waterloo station until around 12:15am, being forced to get a train that took over an hour to get back to Guildford (that journey usually only takes 40 minutes at most, but this train stopped everywhere essentially). As such, I didn't get back to my flat until almost 1:30am, not getting to sleep until around 2am. I don't think I need to say an awful lot in this section, as it is clear to see that The Emirates Stadium is extremely impressive, not just in its overall size (the ground is an all-seater with an overall capacity of around 60,000) but in terms of how comfortable the seats are (although I only sat on mine at half-time), how much leg room there is and how good the views are, even in the lower tier. 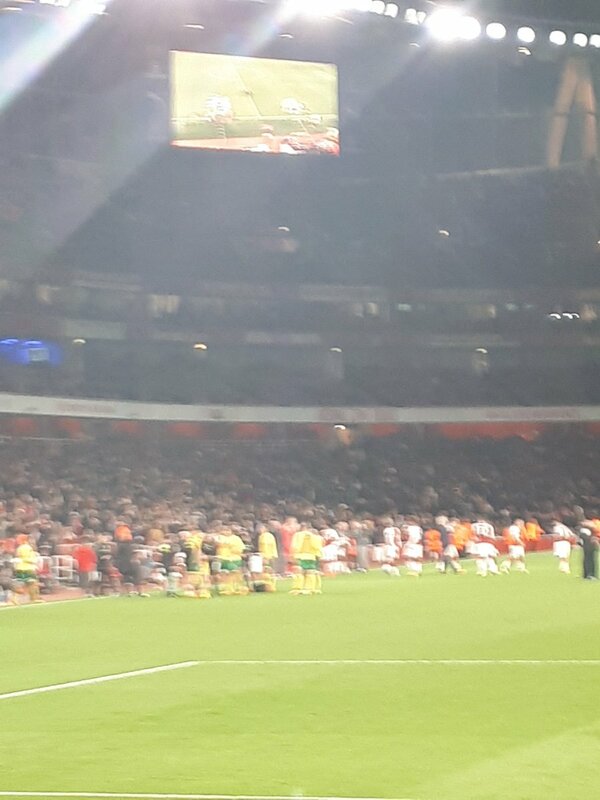 However, it's a shame that the atmosphere doesn't match the ground, as the Arsenal fans barely made any noise until they were winning, and even then they didn't make much noise at all: for almost the whole game, the 8,800 Norwich fans sang louder than the 50,000 Arsenal fans.